Parents from around the world are your fellow visitors to Easy Baby Life, so what could be more valuable than their first hand tips on where to go to have a wonderful traveling experience with your baby. If you have been to a place, please share your experiences too! Any tip from a city with great activities for children, to a fantastic beach or some baby friendly accommodation or restaurant are all most appreciated by parents trying to make the most out of their family vacation. 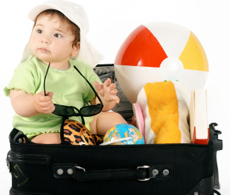 And when you have decided where to go, you can start planning for your trip with the help of these tips on traveling with a baby. Myrtle Beach, SC - Love It! Is your favorite, kid friendly vacation spot missing? Please help us fill in the gaps by visiting our contact page and write a short review. You can of course also share your experienses - good or bad - by posting a comment below.